It is difficult to pinpoint the exact date, but over the past few years, IoT has evolved from being an industry specific term, to a concept that’s more commonly understood by people from all walks of life. There is a race among technology providers to conquer the challenges associated with bringing connected intelligence to the things we interact with. The challenges are diverse – spanning physical size, security, performance, time to market and power consumption … just to name a few. Living on the edge of the IoT are MCUs, like NXP’s Kinetis and LPC product lines. These microcontrollers collect raw data generated by various sensors providing real-time decision making to applications. As our world becomes more connected, the MCUs and even the embedded peripherals like FlexIO are becoming smarter and providing essential functionality to improve performance, decrease power consumption and speed time to market. As consumers expect more from their devices, more is also expected from every aspect of the MCU — even the peripherals. 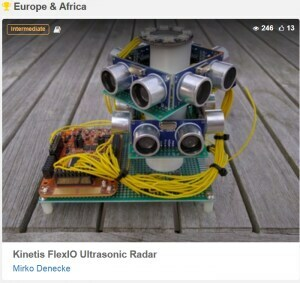 So, NXP teamed up with Hackster.io to create the “Flex Your Mind with Kinetis FlexIO” contest to challenge the embedded community to put the smart FlexIO peripheral to work. Though the contest was focused on the FlexIO peripheral, many of the submissions tackled the challenge of adding connectivity to the base components they were provided. Using any boards they could get their hands on and hard work, contestants improved their designs with WiFi, Bluetooth and even NFC. The contestants overcame a broad range of challenges and it was amazing to see the creative applications from the dedicated participants. We witnessed gracious collaboration as participants shared their learnings and offered advice to one another to help bring ideas to life. One of my favorite submissions is a great example of the type of strategies that will conquer the IoT. 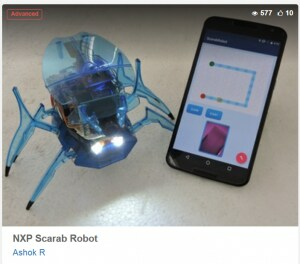 The submission itself was built to provide a foundation for further innovation by delivering a “Flexduino” platform utilizing the maximum capabilities of the FlexIO. This idea offers Arduino compatibility to the FlexIO advanced driver module to build new drivers to interface with high speed multimedia devices such as cameras, digital microphones and others. 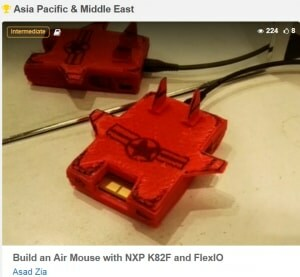 The Air Mouse with NXP FRDM-K82F and FlexIO project presented many opportunities in gaming, entertainment systems and even CAD design. With its 3-D printed form factor, the Air Mouse takes the traditional mouse or pointer to new heights by removing the limitations of controlling a mouse on a surface. In his project the FlexIO allow emulation of various serial communication protocols, specifically I2C. A full description of the project hardware and software set up can be seen on the contest page. From Ultrasonic Radar to robots, drones and more, we were blown away at the creative applications that came out of this contest! IoT is here and FlexIO is helping to inspire innovations around home security, robotics, monitoring, automation and much more that can be applied in a variety of industries. While the contest may be over, the possibilities live on! I encourage you to try out FlexIO for yourself or check out these projects and add your own unique spin. No one can predict which disruptive applications will drive growth of the IoT. 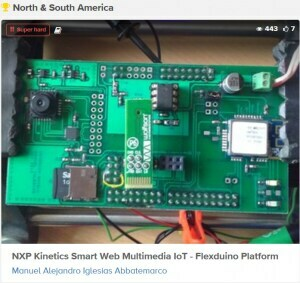 With the FlexIO contest we see an example of how the embedded community and their ideas will be an essential part of how the future unfolds. Provided with a bit of hardware and a goal in mind, the results are a step towards a smart, connected and secure tomorrow.